The Mexican gray wolf (Canis lupus baileyi), a highly intelligent and socially complex carnivore, is the most endangered wolf subspecies in the world. Native to the mountainous woodlands of the southwestern United States and northern Mexico, this rare canine suffered habitat loss and other human impacts so great that it has been effectively absent from the American landscape for more than half a century. Intensive expansion into the American Southwest in the early 20th century marked the beginning of the end for Mexican gray wolves in the United States. With settlement and its related activities reducing natural prey populations, wolves increasingly turned to domestic livestock for food. Threatening livestock operations and perceived-threat to human settlement in general meant an all out war against the Mexican gray wolf. By mid-century Americans had achieved their goal of culling this gray-and-brown coated predator and Mexican gray wolves were eradicated in the Southwest. The wolves’ numbers in Mexico were also greatly reduced throughout the 1900s, making repopulation by migration all the more difficult. The Mexican gray wolf weighs 60-80 pounds and stands 26-32 inches high at the shoulder. Its long legs and svelte body help it to run quickly after its prey (mostly large hoofed mammals like elk and deer). Hunting is no easy task for this wolf, though, as it usually takes several individuals working closely together to take down a meal, which only happens a few times a week. Because Mexican grey wolves live in packs that usually include an adult pair and their offspring, the death of one individual severely impacts the entire group’s ability to hunt and therefore sustain itself. This subspecies is the most genetically distinct among its canine relatives which make already diminished Mexican gray wolf populations especially vulnerable to inbreeding, disease, and natural disaster. The Mexican gray wolf has been recognized as an endangered species since 1976 and about 300 individuals currently live in captivity between the United States and Mexico. Twenty years after gaining this endangered status, these rare predators were returned to the Southwest through a bi-national reintroduction program. 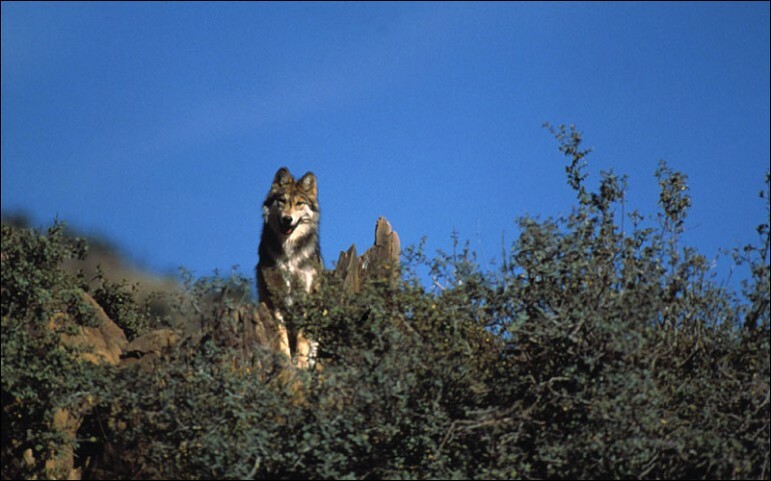 Eleven captive-reared individuals were released into eastern Arizona and western New Mexico in 1998, throughout a region known as the Blue Range Wolf Recovery Area. The recovery program has not attained its goal of restoring at least 100 wild wolves by 2006. There are approximately 58 individuals in the wild, as of 2011. We are far from seeing the Mexican gray wolf restored to its formal glory. The greatest threats to these wolves are humans and our misconceptions about their nature. Although wolf-related livestock deaths are minimal (less than one percent per year) and no people have been attacked since the reintroduction of Mexican gray wolves in the United States, people are still afraid and resentful of these creatures’ presence near their communities. It may be difficult to rally against 100+ years of negative feelings surrounding the Mexican gray wolf, but it is the goal of the Endangered Species Coalition to help shift popular sentiment to a better, more accurate understanding of this species’ role in our nation’s ecological heritage. Hopefully in time, and with your help, we will see Mexican gray wolves return more fully to their natural habitat and we can better learn to share the American landscape with this stunning animal.